I have crossed the Finish Line for the Giant Slamon-ghan Event in the 2010 Ravelympics, on behalf of Team Austenacious. Minor injuries to my fingers, sore wrists, and a very, very suspicious disappearance of 1 skein of yarn 3/4 of the way through (resulting in an emergency room trip to the yarn store) but "Mr. Woodhouse Afghan" is done! All of the family, human and feline, are very happy with this afghan, and will snuggle under it to watch the rest of the Winter Olympic Games. This warm and cozy afghan is named in honor of Mr. Woodhouse from the novel “Emma,” who was always very chilly. 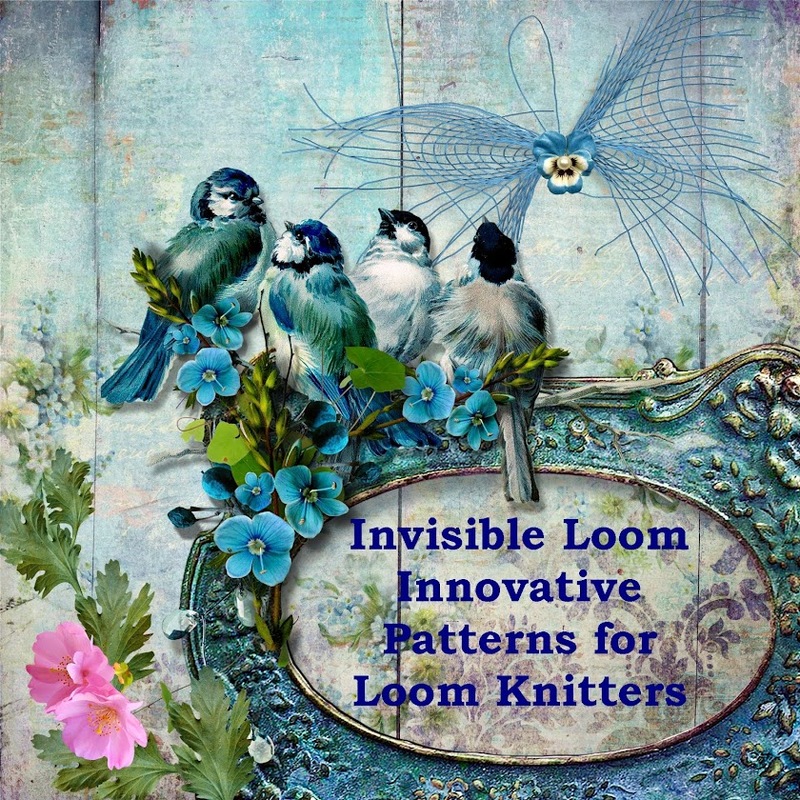 Copyright 2010 by Renee Van Hoy, Invisible Loom and Craft, all rights reserved. Personal use only. Davey Hulse is an amazing knitter, who happens to be blind. He has written a wonderful knitting primer, a book designed for the sighted and the blind, that explains clearly the steps to learn knitting, and provides projects and patterns as well. Update 4/18/11: The book is now available in braille or large print from Davey directly: The Touch of Yarn From the Lion Brand site: This excellent beginning knitting book was written by a blind knitter and intended for both sighted and visually-impaired beginning knitters. The instructions are clear, friendly and straightforward; each chapter is followed by a project that allows you to implement what you have just learned. Concepts covered in the book includ e: Slip knot Cast on Knit Bind off Yarn Over Increase Elastic or Delayed Bind Off Knit Two Together (k2tog) Decrease Purl Purl Two Together (p2tog) Decrease Installing a Life Line Reverse Knitting (tinking) Repairing a Dropped Stitch (Knitting Back Up) Joining pieces together with: *Kitchener *Three Needle Bind Off *Mattress Stitch KFIB, M1 and modified M1 Increases SSK and SL1, K, PSSO Decreases Converting flat patterns to knitting in the round Picking up stitches Tutorials on needles, yarn and organization The author says: "I’ve spent almost a year writing what I believe is the most usable beginning knitting primer in the world. Why? Because I couldn’t find knitting lessons that were free of jargon. I couldn’t find a tutorial that broke every task into perfect detail and made me practice every step before I moved on. Because I couldn’t find a book that was easy to use and recapped things so I could find them quickly. "I want your experience to be better than mine was from the first day you pick up your first set of knitting needles, those strange little pointy sticks. I don’t want you to be one of the sad and frustrated people that try with confusing or unclear instructions and wind up throwing the whole wad of needles, tangled yarn and, dare I say it, painfully awful knitting into a bag and giving it to a thrift store, like I almost did. There is no reason for it… now." "Although pictures are not included, they aren't really necessary, because the text instructions are clear and accurate. The directions for the m1 increase are without doubt the best I have ever come across." -- Deborah Mason, knitter and retired teacher This is the large-type downloadable version of the book. When you purchase it, you will receive a PDF copy that you can read in Adobe Acrobat. he book is also available in digital Braille Ready Format (BRF format) for use in common braille reading devices or braille printers. Our little lemon tree is still giving us plenty of lemons, so here is a favorite recipe for Lemon Shortbread. This is a rich and buttery shortbread, with a great lemon taste. It will keep for several weeks if stored in a sealed container. Not that there is ever any left over to keep! Pre-heat the oven to 275 degrees.Butter a 9" x 13" cookie sheet, and then line with parchment paper. in the salt, zest, and extracts until combined. On a low speed, slowly add the flour, 1/3 at a time, until combined. Turn the dough out onto the cookie sheet. Roughly press into place, then cover with a sheet of plastic wrap. Using the back of a large metal spoon, smooth the top of the dough, trying to get it as even as possible. Remove the plastic. Cut the dough with a pastry scraper or sharp knife, into 1 inch wide rows, making the cookies about 2 inches long. Bake at 275 degrees for 75 minutes, until just slightly golden in color (not browned). Cool in the pan. When cool, invert on to a cutting board and gently peel off the parchment. Using a knife or your fingers, gently break apart the cookies into bars. Copyright 2000-2010 by Invisible Loom and Craft, Renee's Tea Party all rights reserved. Personal use only. Tween Girl is have her 12 and 1/2 birthday party on Saturday. We celebrate her 1/2 birthday, because parties were hard to have in late August, when her friends were on vacation. This year is a Valentine Tea Party. The birthday mini-cupcakes are in the photo. 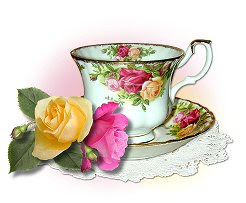 The girls will play games, make valentines, have a valentine themed tea party, and hopefully a wonderful afternoon. Tomorrow night is the cast-on for the Ravelympics! I am on Team Austenacious, and have entered the Giant Slalom-ghan. The photo is my basket of yarn, and my brailled pattern, all ready for opening ceremonies. I am not good at large projects, but this is a smaller afghan, and I have the entire Olympic Winter Games to work on it. The pattern is from the Lion Brand site, and my Teen Girl chose the four colors of Wool-Ease Thick and Quick for the afghan. If you want to join in on the fun, you can find a team and challenge yourself in the Ravelympics. This light weight hat is soft and comfortable to wear, but still has enough structure to flatter hat the wearer. It would make a nice chemo cap, as well as a pretty Spring or Summer hat. The embroidery is optional, and done in a free form design. Buttons, ribbons or flowers would also make lovely accents. 1 1/2 skeins bulky weight (5) cotton yarn. [Sample used Knit Picks Comfy Bulky in Sea Foam,] about 150 yards. buttons, ribbons, flowers for decoration. Crochet cast-on 48 pegs, joining in the round. Working with a single strand of the main color, begin with a purl row, and alternate purl rows with e-wrap knit rows until the hat measures 5 ½ inches. End with a knit row. Work 9 rows of 2 over 2 e-wrap knit stitches by wrapping the yarn around each peg of the loom 3 times, until you have 4 stitches. Bring the bottom 2 stitches over the top 2 stitches. Wrap the yarn around each peg of the loom 2 more times, and bring the bottom 2 stitches over the top 2 stitches. Continue until 9 rows are completed. Do not wrap too tightly, as the loops can be hard to pull over, especially when working with cotton yarn. Decrease by moving every 4th peg to the 3rd peg and knitting the bottom 2 loops over the top 2 loops. Wrap the yarn around the loom 3 times and cut the yarn. Using a large embroidery needle, thread the yarn through each of the remaining loops and remove them from the loom. Gently pull and gather the loops, until a 1 inch opening remains in the center of the top of the hat. Use the needle to bring the yarn through the opening in a criss-cross pattern, and close it. Pull the yarn inside the hat and secure the end. Using a crochet hook, chain stitch the yarn around the bottom edge of the hat, and around the purled rows at the top of the hat, chaining 3 between each of the chain stitches, to make a small decorative edge. If desired, use the embroidery needle to stitch a pattern around the hat with the green yarn as a vine, and the ivory yarn as simple stitched flowers. Even the simplest of stitches will have a wonderful effect. Small buttons, ribbons or flowers may also be used. The February Loom-a-Long on Ravelry is my Carolyn Origami Purse from the Fall 2009 Loom Knitters Circle e-zine. The pattern is available at Ravelry as a large print pdf for $1.00. I'm posting additional photos here to show the purse at different stages of the project. It is not a hard purse to make, and uses stitch variations of knit, e-wrap knit, and purl to shape the purse in one large piece that will fold up. The handle is made from i-cords. The entire bag is lightly felted to give it structure, but not remove the pretty stitch patterns. You can post questions at the Ravelry group, and also at Yahoo groups Decor Accents loom group. Hope you will all join in! Well, not quite Tuesday, but still worth the wait. Some little cherry scones for Valentine's Day. This dough is easy to handle, and makes a pretty scone when dotted with dried cherries and cut with a heart shaped cookie cutter. In a bowl combine dry ingredients. Cut the butter into the dry ingredients with your fingers or a pastry cutter. Stir in the cherries. Mix together milk and egg, and stir into the dry mixture. Mix together gently until the dough forms a soft ball. Transfer dough to a lightly floured board and roll or pat out to 1 inch thickness. Cut into heart shapes with a cookie cutter and place on a greased or parchment lined cookie sheet. I like a 2 inch size for these. Bake at 375 degrees for 15 minutes, or until lightly browned. Cool on rack. MAKE AHEAD AND FREEZE: After dough has been cut and put on the cookie sheet, wrap well in plastic and freeze up to a week. Remove and bake when needed. I have enjoyed making these lovely capelets, or collar scarfs. They are easy to make, and dress up a denim jacket, or sweater with a soft drape and ruffle. There are two versions in the pattern, one without a ruffle, and the other with a ruffle inspired by the costumes in "Cranford" and "Return to Cranford" on PBS. ¾ inch gauge loom (regular) with at least 27 pegs. Sample was made with the Nifty Knitter Purple Round Hat Loom. Pink Sample: Made with 3 skeins Bernat Alpaca in Peony, about 340 yards bulky yarn. This sample used slightly more yarn to complete the ruffle than the green cape. Green Sample: Made with 2 Skeins of Moda Dea Silk & Wool in Wasabi Green, WW wool. It has a tweedy texture to it, and a nice spring and drape that add to the scarf’s wrap. Finished dimensions are 9 inches wide, and about 72 inches on the longer side. Finished size 9" wide, and 78" long on the outside of the cape. Update 2014: A new version of this pattern is now available, with two patterns. One with the plain edge, and one with a ruffle knitted at the same time as the cape. Copyright 2010 by Invisible Loom and Craft, all rights reserved. Personal use only.